In 2015 and 2016, I made some cotton/linen tea towels for my December Open House. 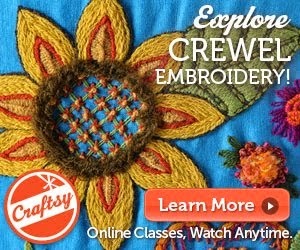 They featured fabric designs of my very own. 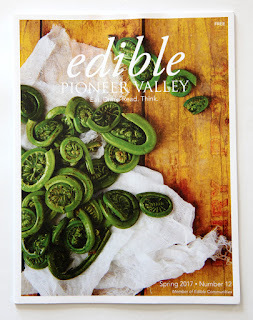 An Editor - Marykate Despres - from Edible Pioneer Valley Magazine came to the Open House. 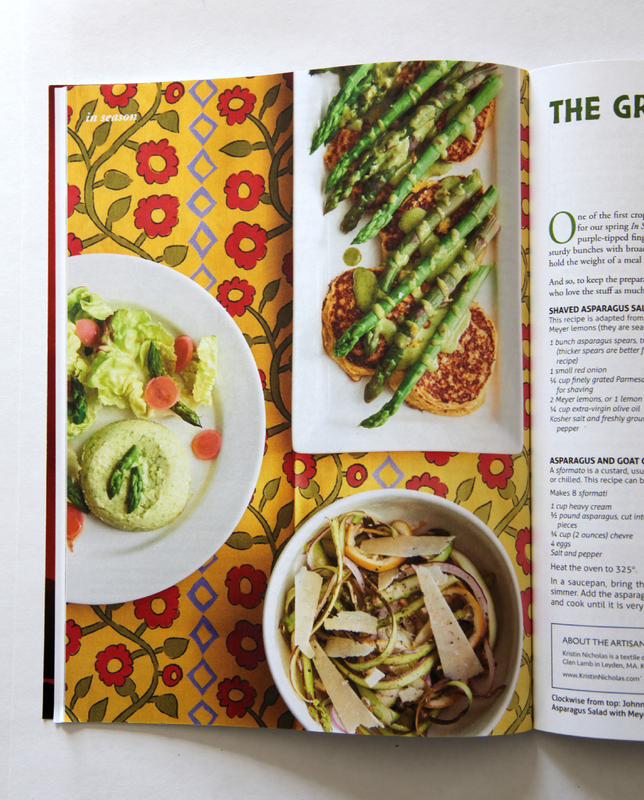 Through that contact, I am thrilled to share my first Tea Towel feature in a print magazine! What a lovely photo. 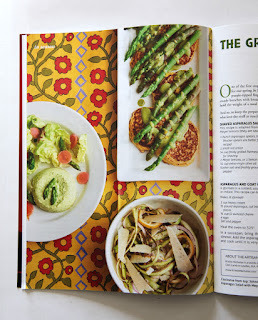 I love the colors and how my print design sets off the colors of the green asparagus. Our valley is often called Asparagus Valley because of the large amount of asparagus grown here. During the "season" we eat fresh asparagus every single night. You would think we would get tired of it but none of us do. I can't wait for this year. 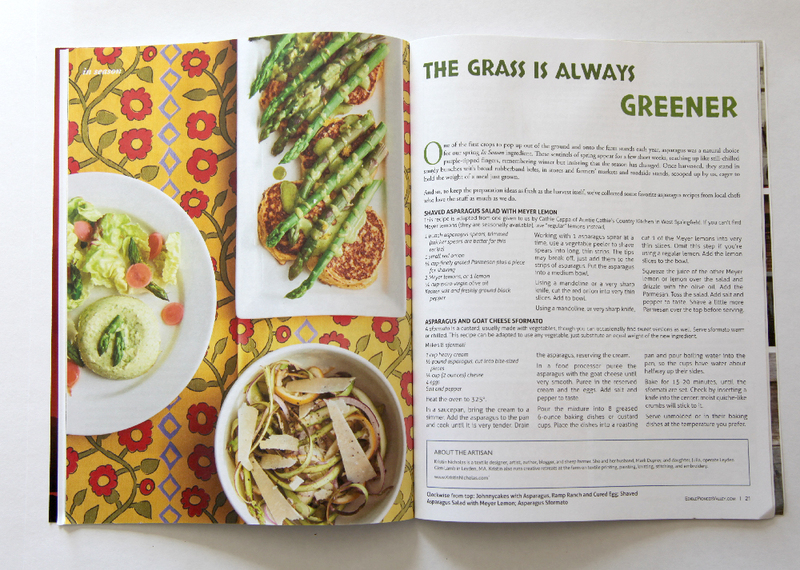 Do you know the Edible Communities Magazines? They cover culinary happenings and local food in over 90 areas throughout the USA. We here are lucky to have one for our very own valley - Edible Pioneer Valley. Check out their website here. 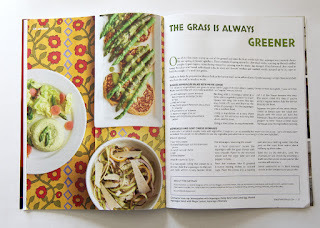 Lots of very nice recipes. 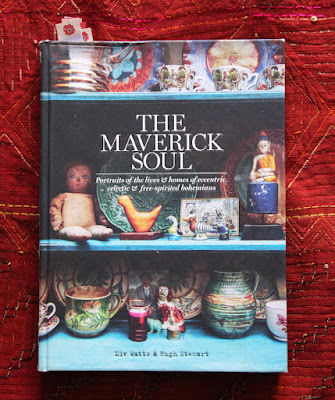 Thanks so much Editor Marykate and Publisher Mary for using my work as a backdrop. I am truly honored to be featured in your lovely magazine. I have a few Tea Towels available in my Etsy shop here. They make lovely gifts. Oh - also if you think the shipping cost is crazy when ordering multiple items, know that I make refunds to your Paypal account if the difference on actual postage cost is more than $2.00. There is no easy way to handle the shipping because my pottery varies in weight and size and you all live in different mailing zones. You know, a funny thing about me, since I'm sure a NON-Culinary type, whenever I read the "Cooking"-section of any "decorating/domestic" mag, I usually pay more attention to the BACKGROUND items rather than the FOOD! - [Unless, it's something CHOCOLATE!] - Such as the table surface, the dishware, utensils, "LINENS"... The FOOD eventually disappears, but the "HARDWARE", is FOREVER! BTW, speaking of "FOREVER"... Just got dumped on by another 5-inches of wet pack snow earlier!